for the ecology movement (and still holds it) — he even had his own title from Gold Key Comics from 1973-76. Gladstone is annoying because that's just the kind of guy he is, which makes him an excellent supporting character if not sympathetic enough to be a star. Woodsy, however, works hard at being insufferable, with his constant preaching about environmental degradation. "Give a hoot, don't pollute" was his incessant refrain. And this hasn't stopped him from being a star. Woodsy was first produced in 1970, for the purpose of shilling for the United States Department of Agriculture Forest Service. He's sort of a counterpart to Smokey Bear, who also delivers an ecology-oriented message on behalf of that agency. He makes "personal appearances" (i.e., actors wear a costume that sort of looks like him) in schools and suchlike, stars in flyers and brochures, and does an occasional public service announcement on TV. With the November, 1973 Woodsy Owl #1, Gold Key got into the act. The bulk of Gold Key Comics' output was devoted to licensed material such as The Pink Panther or Yogi Bear, but there was also a smattering of company-owned characters like Wacky Witch or Mighty Samson. Woodsy Owl was somewhere in-between. 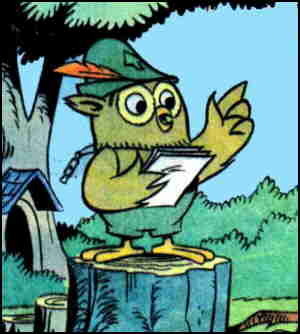 Western Printing and Lithographing, which owned the Gold Key publishing imprint, held the copyright to all Woodsy Owl material it produced; however, it was done with the Forest Service's permission. At Gold Key, it almost became a schtick to show how annoying he was. He was constantly haranguing his neighbors, such as Mrs. Hare and Hot Lion; and while they'd give lip service while he was watching, they often backslid when he wasn't. His protege, Bitsy Owl, was on board with him, but often made naive mistakes, damaging the environment even while trying to help. As for bad guys, such as Brute Bruin — don't ask! But even a less-than-lovable protagonist can make a go of it, when publishing his adventures makes the people behind the venture feel warm and fuzzy inside. Apparently, however, their capacity for warmth and fuzz wasn't infinite. The comic book ended after ten quarterly issues, the last one dated February, 1976. With Woodsy's comic book now a distant memory, Woodsy himself continues to promote ecological goodness for the government. His slogan has changed. It's now "Lend a Hand — Care for the Land!" This doesn't scan as well, but that's how it is when a character's primary purpose is something other than resonating with the public.